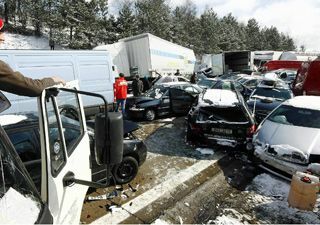 Thirty people were injured in a massive car chain collision accident on the D1 motorway between Prague and Brno in the Czech Republic yesterday. The crash involving 116 cars, left thousands blocked in the tailbacks along the motorway in a snowstorm. It was was a record car jam for the Czech Republic, but it did not come close to the sad record the UAE set a couple of days ago, which involved 227 cars. I think it is terrible that in this day and age we can not do more to prevent road accidents. I think we need a global crack down to avoid this happening again. When will we realise how precious life is?